It’s that time of year again – new trainer season. Or more precisely, just about the end of new trainer announcement. Wahoo’s been busy this summer between the new KICKR SNAP announced last month, as well as the new Wahoo ELEMNT MINI announced earlier this month. But now, here at Eurobike, we’ve got two further announcements, including a new Wahoo KICKR as well as the CLIMB accessory for Wahoo’s 2017 trainers. I talk about the CLIMB accessory in this totally separate post, so go check that out there. B) Integration/compatibility with Wahoo’s new CLIMB (see above). 3) More/better clearance for disc brakes and flat mount brakes. As you can see, in many ways this is basically just like what Tacx did last year with the Tacx Neo update, which was pretty minor and just aimed at increasing bike frame compatibility. 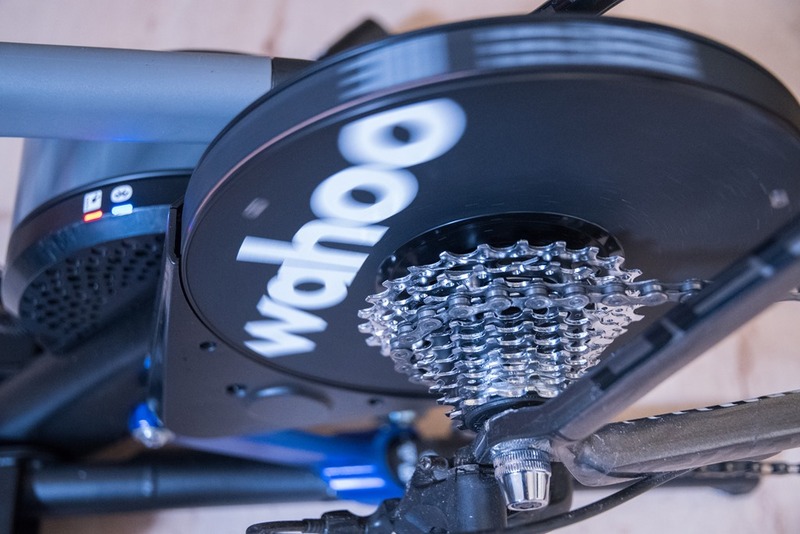 The same here, though with the additional thru-axle compatibility they are more competitive with the CycleOps Hammer, which had pretty wide compatibility compared to Wahoo previously. If you look closely, on the left one (2017 edition), you’ll see near the flywheel, where the skewer is, it’s cut-out to improve compatibility for disc brakes, especially for CLIMB. The right one (2016) is flat in that area. 3) Improved Responsiveness: Another hardware change increased the responsiveness of the unit during massive instant leaps of power (I.e. 150w to 500w). Eventually I’ll spit out an in-depth review, likely in September sometime, but for now it’s First Look style. Mostly because almost nothing has changed except compatibility items. Still, it’s worthwhile checking through to the accuracy pieces. So I did a few workouts over the past 2-3 weeks to validate things are all happy panda. Here’s a look at one that I did back while testing out the new Wahoo ELEMNT/BOLT workout control that was recently released. You can find the full DCR Analyzer set/files here. While you’ll always get slight differences between units at peak power (max power) in a sprint, these are all incredibly close together. You can see one minor recording oddity on one head unit (of the two) that were connected to the Garmin Vector pedals, but that’s a transmission/recording quirk and not a native data quirk. None of this is really any surprise. People have universally been happy with the 2016 KICKR from an accuracy standpoint, which outside of compatibility items is identical here to the 2017 KICKR. Also, if you didn’t know – the earlier KICKR’s all received a firmware update that allows you to leverage the same accuracy tweaks as the 2016 KICKR received; that update came out earlier this year. If you’re looking for some more data, here’s another ride I did with additional data. This was while testing out the new Wahoo ELEMNT/BOLT workout control that was recently released. Overall as you might guess there’s little reason for most people to rush out and buy a new KICKR if you’re already a KICKR owner…unless you want CLIMB compatibility. But if you’re in the market for a new trainer, especially a new KICKR, then certainly you’d want to pickup the new KICKR 2017 (KICKR 3). And the good news is you won’t have to wait long for that because it’s in stock today and starts shipping today. If you’re looking at trainers in general, I don’t anticipate any other trainers here at Eurobike, and I think we’ve seen the end of new units for the season. Though there could always be one or two minor ones at Interbike in a few weeks. Depending on what I hear there I’ll either release my annual trainer buying guide in the next few weeks, or right as Interbike gets underway. When the 2016 was launched it was pretty obvious from the pictures that there was significant issues for post mount chain stay mounted disc calipers. For me, it was an immediate “nope” won’t work. Almost funny how it looks like then have used an electronic sander to carve out the necessary space. Surprising really (considering that the bike manufacturers “push” of disc brake road bikes was well under way) how many wheel-off trainers had issues with calliper having to be removed. Would be interested if this is an oversight or if disc uptake is actually quite low … what % of new bike sales $1500+ are disc? The Climb looks interesting and fun for those who are very into Zwift. Ray, will the price stay the same for the Kickr2017? So does it work with the frame’s own thru-axle now or are wonky adapters still required? I called Wahoo support and they confirmed. How is the noice is it less loud then 2016 verison ? Same at the 2016 model, no changes from that (bit still better than the original 2012 model). If you have the Kickr 16 and enough frame clearance can you still use CLIMB? No, the 2016 model lacks the pivoting axle and will damage your frame. One more reason to stick with my plan buy an Elite Dorito (cough) I mean Direto!! Why? I just switched my plans from the Direto to the Kickr. and me! i thought the direto didn’t read so well *apart from the accuracy(?! Any codes for Clevertraining.co.uk Ray? Can I still link through to it for the uk site to give you credit? Yup, absolutely – I definitely appreciate it! Will Wahoo stand behind its previous loyal customers and provide an axle adapter kit to use the Climb with older Kickrs? I wonder if the 2016 will go on sale anywhere. I don’t see anything yet but it’s early. last week the v2 was definitely £100 off at wahoo’s own online shop link to wahoofitness.com and at the same time there was a whopping additional £250 (ie £350 total) off reconditioned units) not sure if that is true in all geo’s. Hi Ray, Wattbike are releasing a indoor bike in four days…..Perhaps it will be truly Zwift compatible. Like the Power Tap ones should be…That would be interesting. The space in the DCR Cave has shrunk a lot lately…stay tuned. I am in the market for smart trainer and have a Giant road bike with disc brakes. I never gave a thought about compatibility with smart trainers. Does anyone know if Elite Directo / Wahoo Kickr 2016 version work or am I going to have to look at using the Wahoo Kickr 2017? I’m in the same ⛵️. I use the 2016 Kickr with a 2017 Defy. The rear disc brake fits but its pretty close. Can you please tell us about the Tacx NEO from Eurobike 2017, this is about the only thing I care about and is critically important in my decision to either buy one now or wait for the new model. Thank You. There’s no changes to the Tacx Neo from a hardware standpoint at this point. There are some firmware updates on the way, but just minor stuff as always. There is also a Tacx Neo Smartbike coming a year from now (indoor bike). Unless you have a disc brake bike with thru-axle! With the 2017 Kickr your bike should fit without removing rear brake from bike, kinda a big deal for those of us with post-mounted disc brakes. This puts the Kickr 17 back on my short list. And instead of wonky not-in-the-box QR conversion kit required with 2016, with the 2017 Kickr the conversion kit is in the box. And your existing axle is used to attach bike to Kickr, no weird QR conversion thingy to deal with every time you go to ride. I’m looking for a smart trainer. Not sure what to buy. I can’t see any reason to opt for the old version of the Kickr, unless the drop the price. Tacx Neo has my attention…but then are any of these worth £400 more than the Flux. Do I really need to simulate an incline >10%? Any idea if the adapter to utlize 12×142 thru axles will be available for sale/ue on the 2016 model? So I tried to purchase the new kickr with your clever training 10% code and it stated that the code does not apply for this product? Is the kickr and excuded product? You get points for some products which you can use immediately for your next order. Some manufacturers don’t allow discounts. I just ordered a Wahoo product through CT and you can only apply their CT points against the order, not a straight 10% off the total. You will earn 10% in CT points for use against a future order however. Does that work on the UK site too? Is it 10% of the value in points if so I could spend them on the climber later? Paul…sorry, I’m in the States so I’m unable to answer your question. I have a Tacx Neo. I can lift the front wheel up and down and nothing rubs/grinds. It looks like if Wahoo let Zwift (or anyone else) control the Climb instead of going through the Kickr, they’d open up their market to existing trainers where there is no rubbing on the quick release attachment points. DC – you see any reason the Climb in Manual mode would not work with a Neo? I don’t know if you have to ‘activate’ the unit in manual mode with a KICKR or not. Will have to find out. Appreciate it thanks. Didn’t even think of that. Thought it was more of a mechanical issues. Do you think there will be a upgrade kit of sorts to allow 2016 to work with climb in future? 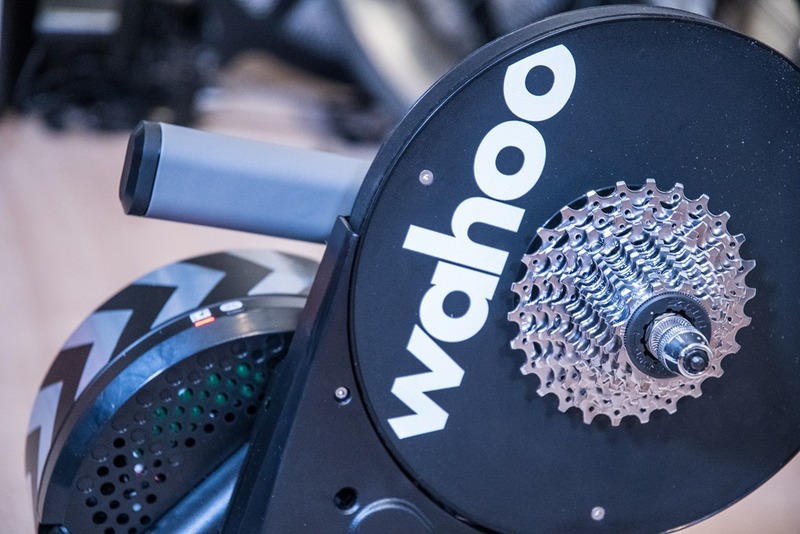 I do think that people will find creative solutions around this, but given the very clear (and rear) mechanical concerns about potential frame damage – Wahoo definitely won’t likely support the earlier KICKR units. Now…for the SNAP, that’s a different story. I bought my kickr in July 2017 and was bummed after watching the kickr climb review thinking that it would not be compatible. what i did notice today was that my kickr has the ability to pivot my bike freely at the rear skewer when I lifted it. Does this mean some of the recent 2016 kickr models have the upgraded skewer? if so, will this mean it will be compatible with the kickr climb, or will it still be incompatible due to a software issue? I think I can convince them to open up the KICKR SNAP to allowing it, since they’ve admitted there’s almost zero reason it will impact the frame. But I can see their concern on the KICKR. Ray – What do you mean by “open up” the Kickr Snap to “allowing it”? How is the software of the 2017 Kickr different from the 2016 Kickr? As you already know, the lack of mechanical compatibility of the pre-2017 Kickrs with the Climb is causing quite a bit of consternation and frustration. In short, in pressing Wahoo a bit more – there’s actually no technical hardware reason the SNAP V1 can’t do it. Wahoo initially said there were hardware concerns there, but that’s factually untrue, and they admitted as such after more pressing. The only hardware difference is a tiny bit of change in the holder mechanism with some additional grooves. But they said in an absolute worst case scenario it might cause a tiny bit of paint loss on your dropouts, maybe (emphasis on the maybe). Unfortunately, it’ll require a firmware update for the existing SNAP’s to work with it. Why is it no one that does reviews on trainers ever asks the company to make a cat 5/hdmi etc. connection to their unit so that you can hardwire it to your compute or router if you so desire? I had the Kickr first generation and loved to train with it. However I switched to MTB and it didn’t fit. I have a trek ProCaliber 9.9SL Boost frame and it was not able to fit. The CycleOps Hammer and the latest KICKR 2017 model fit the 148 x 12 Boost axle standard. As for the cassette, I don’t think anything fits the SRAM XD body or cassette at the moment. (I reserve the right to be wrong.) So I don’t think you have a choice for an Eagle compatible, wheel-off trainer right now. So you can’t use a 12 speed Eagle on a KICKR? No, the freehub is not compatible. There could be an update later, but no option for XD driver on any wheel-off trainers. You will need a wheel-on trainer and appropriate thru-axle adapter, along with a smooth tire to run an Eagle equipped bike. But it’s possibile TO use Sunrace casette 11-50 12v that don’t require XD body? I’m interested both in kickr and taxc neo (maybe fior the neo there’s been a news in the freehub in jan2018)? I use it since last week, a XD body (10-50 cassette) and a Kickr 2017. I use the standard 11 speed cassette on the Kickr and there is at least one or more sprockets that don’t rattle. Swapping to another chain might make it work on all sprockets. Since I use ERG mode all the time it’s a solid workaround. but you have a mtb with sram eagle 12v and when you train with kickr use te standard 11 speed or you have tryed the sunrace 12v in the version not XD body? I use the 12 speed drivetrain with an 11 speed cassette. I pay attention not to over shift either way. Ok but when you take the bike for use outside you need to re calibrate all the times? I zero my Stages before every ride and do a Kickr spindown every time the bike was off the Kickr. Is the bike 2 weeks on the Kickr, I do a spin down every 2/3 days. hey steven, i’m looking to get the 2017 kickr, but my bike has 12×148 and sram 12 speed eagle drivetrain as well. do you need to adjust your cable tension? so you simply take your wheel off your 12 speed bike, and drop it directly on the kickr’s included 11speed cassette and it works? provided you dont shift too much into too low or too high of a gear? Love the site and reviews. However, I think that there is a significant hole in your trainer noise measurement procedure- you only measure noise in steady state with constant speed and power. 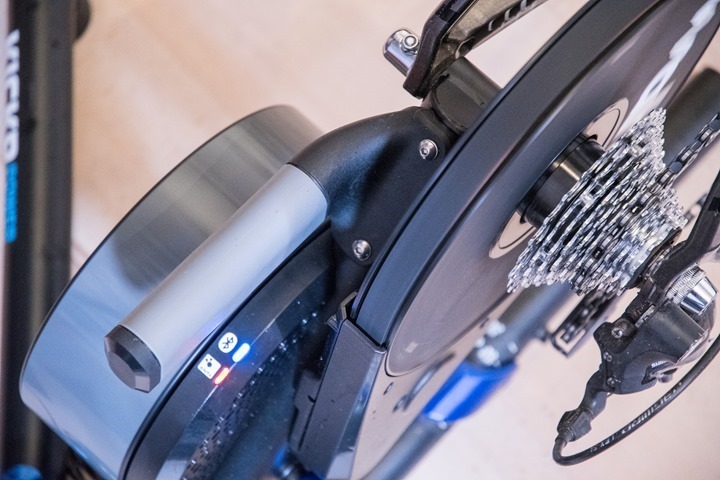 However, some trainers, like the new Kickr3, are many times louder when the brake is operating. Like when you coast, ease up after an interval, or if power is varying significantly. My Kickr3 really screams when the brake is operating even though it is pretty quiet most of the time. This has really screwed up getting along with the neighboring apartments. I had a Kickr Snap and neighbors on both sides complained about the noise and vibration. So I bought the Kickr3. They complained again. They said it was mostly quiet but they could hear an annoying screaming noise at times. So, I traded the Kickr3 in for a Tacx Neo and everyone is happy. I think you ought to add a peak noise test to your measurements. Pedal up to a high speed and then coast (Zwift in % mode, for example). Then measure the maximum sound level. My estimate is that the Kickr is about 4 times louder when coasting. And it’s at a very annoying frequency. I’ll be honest, I’m confused. I just tried it on a KICKR3 and with a decible meter, and there was zero bump in sound, just a straight curve downwards. I spun up really fast, and then held it, and then let it go. I’ve never heard of what you describing from anyone else, though perhaps I’m missing something. I’ll see if I can explain better. This is a problem that I noticed from the day I got the Kickr3. I had roughly 100 miles on it before I sent it back. I found that when I was pedaling at constant power (in Zwift or TrainerRoad) the Kickr sounded like your videos- a high pitched noise that was a bit louder than the drivetrain noise and more or less equal to my fan. But not too bad. When I would coast (or ease up) after a hard interval, especially in Zwift where it was NOT in Erg mode, the high pitched noise would get a lot louder. I don’t have a dB meter but it was significantly louder than my fan. Enough that people would complain from next door. It would start very loud and gradually quiet down as the speed coasted down. Other than that one thing I was happy with the Kickr. What you are describing is the noise from the freewheel. It happens when you stop pedaling and the flywheel keep spinning. That is the same basic noise that most bikes make when coasting. There are designs that have different tone, volume and frequency when the freewheel is coasting. In my opinion, there’s meant to be minimal coasting when doing indoor riding and training, so I see it as a lesser issue. It might be nice if they used a quieter design. Many of the reasons you want a more effective freewheel for outside riding are absent for inside riding. That being the case, there are several freewheel designs that are quiet and nearly silent for some. You could be right that it is the freewheel and not the brake. If so, it is the loudest freewheel I have ever heard. Maybe there is some sort of resonance in the flywheel or structure. I guess it doesn’t really matter what the cause is if it annoys the neighbors. I know I’m right. The electromagnetic brake on these is near silent. It is applying a magnetic current between to parts that don’t touch. There is nothing more than the wind around the flywheel and the bearings in the system of the brake that will make any noise. I have a CycleOps PowerBeam Pro with a similar brake, but is a wheel-on trainer. It is the quietest trainer I have ever used (note, I’ve not used a Neo). The PBP is a pure example of a straight resistance unit (with no gear reduction via pulleys and belts like the KICKR) and it is super quite. I’d make a big bet the basic freewheel is loud and is amped up because of the large structure around it, so I think you have that part right. Besides, if it was the brake itself, it would make that level of noise anytime it’s at that resistance level. Since the resistance level can be the same when you coast (the flywheel will just slow down), it would not increase only when you coast. That points directly to the freewheel mechanism as the source. Nothing else makes sense. I know that the brake itself is silent. When you ease up or coast the brake applies more pressure to try and keep the power the same. The thing that I don’t know is about noise in the reduction gearing and housing when the brake is applied. The brake is inside the rotating black housing which has (according to Ray’s interview with Chip from Wahoo) a 40:1 belt reduction from the flywheel meaning that it is rotating 40 times as fast as the flywheel. Since the belt has flexibility I was thinking that there might be some oscillation in belt tension as the brake is applied which creates mechanical noise. Of course, I have no idea if this is the case or if it is the freewheel since I don’t have the Kickr anymore. At this point it doesn’t really matter and I still think that the noise needs to captured in the testing somehow. What’d odd though is that the freehub (as others have stated) shouldn’t really increase the volume. The reason I haven’t captured it in testing isn’t because I haven’t tested it, but because it made no appreciable difference. In today’s test, certainly the freehub is a different tone – but is indeed less in volume others. The Neo would operate identically (actually, it’d be louder since the base volume is so quiet). The only way it would get louder is if something is broken in there. Which is I guess where I’m confused. Obviously you don’t probably have a recording of the trainer, but I’ve honestly never heard of anyone having that specific issue with a KICKR before (of it getting louder). I went to a friend’s house and recorded his Kickr. I did this all by turning the cranks by hand and setting the phone on the floor next to the Kickr. First I just backpedaled to get the freehub noise by itself. Then I pedaled forward for a bit until I got the speed stabilized (with my hand of the pedal) then I coasted. I repeated this a number of times. Each time I coasted the basic “howl” got louder with the free hub in the background, as soon as I pedaled again the “howl” got quieter by a lot. So, that is two Kickrs that do the same thing. Listen to the attached file. Still no file. Does the Choose File not work? Is there a place I can send it directly? i can confirm that the Kickr 2 is loud. I’m on a proper house – not apartment – and was in the 2.5 car size garage (garage door 3/4 down) and wifey came home to me spinning on the kickr and she laughed – she said that thing is LOUD. Coasting does make it whine like a jet engine ! By the way, i’m spinning because the Kickr (2 days old) could not reliably link up with my Samsung S2. It’s flaky – I’ve not had a single minute of riding it properly. Anyway back to the LBS to get it sorted out later in the week. I have the same problem with my 2017 kickr riconditioned, i buyed it in 06/2018. Is it the same kickr? I buy it in europe location, in Netherland. Now i asked to wahoo support the return-back of the kickr because this sound is unsopportable for me and for my neiborth. I would purchase the 2018 release, because my 2014 kickr was great. FYI, the KICKR V3 no longer supports Campy 10-speed freehubs. I got the V2 with fingers crossed that Wahoo would eventually come up with a Boost-148 compatible hack, which they did in the form of a new model…I would like to train on both my RB (Campy 10sp) and MTB (12×148). Wahoo CS replied that I just need to upgrade my RB drivetrain to 11sp…..LOL, that’s “just” about alotta money, and I recently upgraded all my 10s Record components….. I sent back my Kickr3 because it was too noisy. I replaced it with the (unfortunately more expensive) Tacx Neo. That trainer has been great so far. Very quiet. One additional feature it has is an Edco universal freehub body that takes all Shimano, SRAM, and Campy cassettes. I don’t know why more trainer companies don’t do this rather than require you to buy multiple freehubs. You can get a 148×12 axle adapter for the Neo and then use one trainer for all your bikes. I don’t know the answer for sure but I have purchased the Kickr17 and so far had my canyon road bike, Hoy town bike and XC MTB on it so I’d be amazed if it didn’t!! Hi Sam, no problem with Cervelo P3 frame size 54 and Kickr2017! Just got my Kickr. For Zwift [and other such apps], is it better to connect via ANT+ or BT? Using a Macbook Pro new model. Also, to pair the Kickr to my Elemnt, is there a choice between BT and ANT+? So if I am looking to buy the new Kickr 2017, the only way to know it is a 2017 versus 2016 is the cut out near the skewer? No model or color, etc? So looking at the Kicker and Snap. Reading all the reviews and comparisons, it appears that there is very little difference between the two except $600 price tag. I see there is a 2 lb difference in the flywheel. Both do everything else. One is wheel on while other is wheel off. IS this really worth the extra $600 for the Kicker over Snap? I just got the kickr and the ride feels a lot smoother than the Snap. I had the Snap for 2 years and fried the motor (expensive mistake keeping it plugged in). You will get great workouts with the Snap too. It is worth spending the money if it is something you will use often (but can’t go wrong either way). You leaving it in says more about Wahoo than yourself. There’s no way that they should allow it being plugged in continuously as a possible cause of failure. The only exception would be if it was receiving power out of the recommended range on the power supply. There should he a sleep/disconnect function that protects the device under “normal” use of being plugged in over time when not in use. If that’s what they really expect (or worse, used to avoid a warranty claim), then that reflects badly on them. At the very least (even if they tell you to unplug it) they should look at that as “expected misuse” and design the unit to handle that situation without allowing damage to occur. Maybe there’s more to the story than this, but if not, color me unimpressed in their service and/or design. To be fair, he didn’t say why it died being plugged in. Power spikes are real, and hence why you have surge protectors. That said, they’re also incredibly rare. Anything is possible and “user error” is a common problem in many ways (not to say that’s really what happened here, because I have no idea). Yeah – don’t know if it was a surge or not (I assume yes). Just bought a surge protector for the new one and keeping it unplugged when not in use. I reached out to wahoo and it is a 1 year warranty so I am not faulting them. They have a repair program but I don’t want to keep putting money into since it is fried. I am planning on purchasing either a Kickr or a Hammer in the immediate future. My one concern is with the noise of these trainers. Currently I have a Computrainer and a Kurt Kinetic Road Machine. How would the Kickr and Hammer compare to the CT and KK with respect to noise? I just placed an order for a Kickr which I hope to have later this week. Once I make sure there are no issues with the unit I receive, I will be selling the CT and KK. Looking forward to a new training toy. My initial plans are to use it primarily with Trainerroad, but once I purchase a new notebook later this fall, I will definitely be giving Zwift a tri. I have never had a trainer so I would like to know if the rear derailleur has to be re-adjusted when you put your bike on a trainer and then put your rear wheel back on? Maybe. 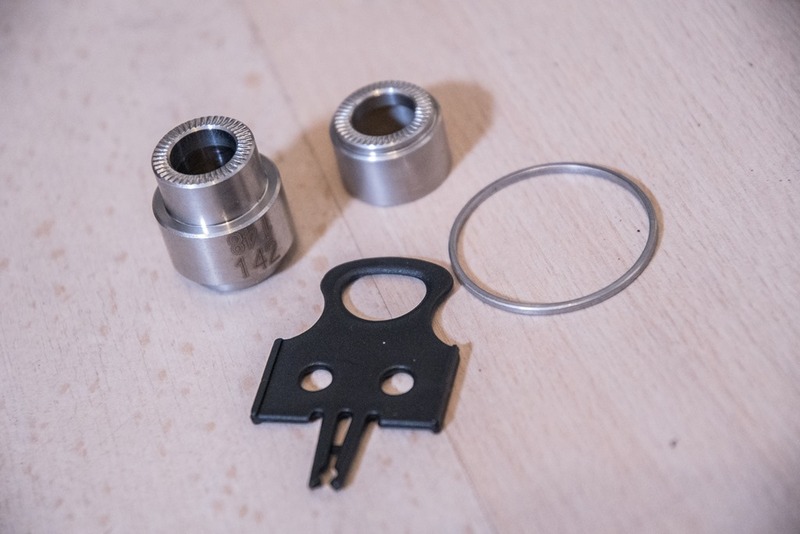 Just as with swapping from one wheel to another, there can be subtle differences in cassette position that require a small adjustment on the barrel adjuster to get proper shifting across the range. Sometimes, you get lucky and there are not changes needed. Sometimes it takes a small twist. So Wahoo makes bike computers, speed sensors, cadence sensors, HRMs. When do we think they will pull the covers off their own power meter (likely pedals?) They have the expertise and practice carrying over from KICKR development. It’s a crowded market, but so is the trainer business…and it might help them grow sales of the Elemnt as well… A lot of us want the whole widget. It annoys me that if I make the switch to the Elemnt Bolt, I lose Cycling Dynamics from my Vector 2s. I just upgraded to the 2017 Kickr from a 2016 Snap…. Compared to the Snap running a blue Tacx trainer tire… This thing is WAY louder than the Snap and as someone else said, it sounds like a turbine howling when you stop pedaling. I little bummed I didn’t test one out before I sold my Snap. Noise depends on the speed that you are cycling at. Proper choice of gearing keeps the noise is very low. In Erg mode I use the small chain ring and the fourth largest gear in the back. This keeps my speed around 12mph at 90rpm. In Level mode I use of setting of 8 which also allows me to stay in the small chain ring with speeds under 20mph. Using the large chain ring, things can get pretty loud. Unfortunately Wahoo’s 142mm/148mm adapter is not compatible with my 2015 Trek Domane Disc (post mount disc brakes). The post for disc brake prevents the adapter from sitting flush in dropout. Working with Wahoo to resolve. Wahoo was great, they took the 142/148mm adapter and made it a 142mm only adapter. Received it yesterday and I’m back on the Kickr 2017. I don’t understand. I have a 2018 Domane ALR5 Disc and the included adapters on my new kickr17 work fine. I have RS505 hydraulic brakes it comes with. your 2018 ALR5 has flat mount brakes, and does not have the clearance problem found on Domane models with post mounted disc brakes. Does anyone know if you have to use the RPM sensor included with the KICKR? Or can I just keep using a third-party cadence sensor I got with my bike? Has anyone else had derailed alignment problems with the KICKR 17? It seems like the little collar that sits on the drive side to allow the movement of the bike when used with the climb is wider than the standard collar between the free hub/cassette and the drop out? I’ve had to shift my di2 derailed in by 6/7 clicks. Thanks great review. 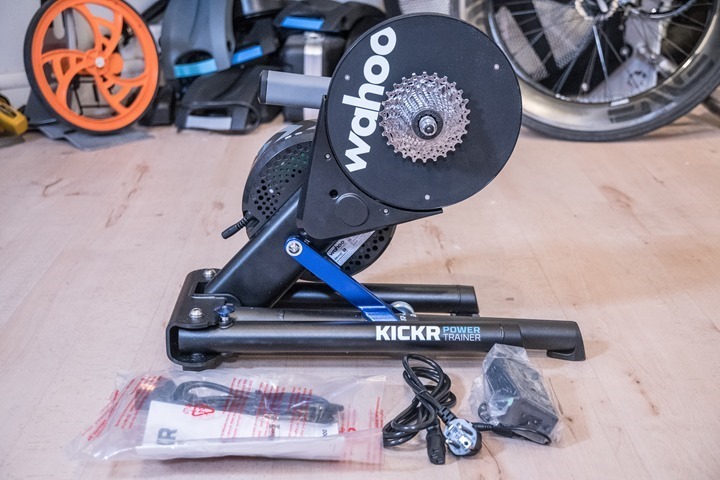 Given Wahoo are offering the Kickr 2016 at $899 on their website my instinct is this would be the best value for money option on the market if you don’t intend to invest in the Climb option. Or would you still feel the Elite is the better choice at that price point? If you don’t intend to get Climb, then definitely, go pickup the $899 deal for sure. At that price point you’ll get better road feel on the KICKR than the Direto. Looks like the serial number on at least the 2017 kickr doesn’t have anything to do with the ant+ id or the alphanumeric bluetooth id (hexadecimal?) shown on an Edge 1030. So when in a room with a bunch of kickr units and you want to pair with the one you are on…. Why can’t they make it simpler? I have the new Kickr and a P2M Type S with 3000 miles on it and the battery is good. I warmed up, conducted a spindown, and completed a 20 minute test on TrainerRoad. The Kickr measured 351 watts and the P2M measured 329 watts. I have since completed an advanced spindown, manually calibrated the P2M, and finished 5 more workouts but am still getting a similar discrepancy at wattage levels from 130-400 that I’ve tested. The bike has remained inside at very consistent temperature and I have started coasting for 4-5 seconds between intervals so the P2M can re-calibrate to no avail. I’d love to recreate the accuracy results you have so any ideas I should try? Unfortunately I don’t have a 3rd pm to compare with. The P2M is upstream of the kickr and reading lower power so it’s not a drivetrain issue. I’m probably just going to resort to powermatch so the readings are from my P2M always. A little disappointed when both companies claim +\-2% and then you have a 5-10% difference in steady intervals. I was hoping to have similar results to dcrainmaker. Yeah, always hard to tell without a 3rd PM. I agree, if the numbers were inverted, then it’d make sense (or at least, sorta make sense). And I presume your manual cal of the P2M was inside after temp stabilization? Yes, my bike had been inside for days. I’ll try the advanced spin down and manual calibration again but even Wahoo recommended using power match so my numbers are consistent indoors and out of the difference remains. Last week I bought the new wahoo kickr. I use it ik combination with my mtb. I experience problems with my drive train (my shifting doesn’t go smoothly) and my chain is popping. Can someone help me? Am I doing something wrong? That sounds like you may have either the wrong cassette (speeds) installed, or if you’ve swapped cassettes on it, that perhaps your missing a spacer (or have too many spacers). Which model KICKR did you buy (i.e. 11-speed), and how many speeds is your MTB setup for? Bought the 2017 model with the 11 speed cassette and is compatibel with my mtb. This morning I arranged my gears and it works better now. When I put my wheel back in my mtb I’ll have to arrange it with my back wheel. Yeah, typically speaking I almost never have any issues as long as both cassettes were properly installed going back and forth between wheel and direct drive trainers (across a lot of bikes). Occasionally very fined tuned differences, but nothing major. My guess would be that the MTB cassette has a spacer in the wrong place. Of course, if they tuned it for that, you’d never notice by itself. I think the issue is more to do with the 2017 Kickr specifically, it has the additional nut that moves freely about the axle between the frame and the Kickr, this means the whole bike is shifted to one side slightly (2/3mm) enough to require re indexing though..
Do you think if I install a xt cassette (the same as on my wheels) the issue wil be solved? I am about to go bonkers here. I swapped out my KICKR2 (2016) for the new KICKR 2017 because when I bought my wife a brand new Canyon with thru axles, I realized that I either needed the adaptor kit and/or could use the neat trick with the new KICKR which seemed far simpler for thru axles. Now think I made a mistake. Cause even though her bike works fine on it, and she can cycle thru the 11-speed cassette on the KICKR, mine… skips and can’t get to certain gears even though I have an 11-speed as well (two Giant Defy Advanced bikes, one an SL 1 and one a Pro 2 2016). Both bikes worked awesome with the KICKR2 I got last year in May (and which I now stupidly sold off)! Anyone figured out what is going on here? DO I constantly have to adjust the rear derraileurs to deal with this when I pop my bike off and on. That is just a pain in the #(*#$ if so. Or could this be a defect of some kind with certain of the KICKR 2017 models? Now I wish I hadn’t swapped out the KICKR just for my wife who doesn’t even ride as much as me! I just bought a 2017 Kickr after riding 2016 Kickrs at a bike studio and wanting the experience at home. I cannot get my 11 speed to stop skipping even after adjusting the tension and resetting limit screws. Wahoo basically said I’m SOL. Does your Kickr connect to your Wahoo head unit by BT or ANT+? When I pair my Elemnt with my phone first, my Kickr connects by ANT, but the erg mode has issues. When I connect my Elemnt to the Kickr first [with my phone BT off], it connects by BT. I can then connect the head unit to my phone, also by BT. Everything works, but I thought that Wahoo suggests connecting by ANT over BT? I’d have to defer to Wahoo on any specific preference. The KICKR can only sustain a single BLE connection to it as far as I know, thus likely the reason it sorts the way it does. But I’ve never heard of issues in terms of things like ERG Mode responding differently based on protocol with native Wahoo apps/devices. As you call tell from my email I am not tech current. I am thinking of buying the KickR and after reading the discussion I did not see where anyone is using Garmin 520 with their unit and Zwift. Will this work? I don’t need or want to buy another bunch of HR,cadence, power, speed sensors just for an indoor trainer. Thanks. Yes, I have my Kickr sending data to both Garmin 520 (via ANT+) and to Zwift running on my MacBook Pro laptop (via Bluetooth). No issues, works great. Why couldn’t they make the thru axle adaptors magnetic so they can’t just fall out of the trainer when moving it without a bike. Maybe some place to store the disc brake caliper insert too? So I am looking for some advice. I am planning on purchasing a KICKR pretty soon as seeing as BMC specifically says “DO NOT PUT OUR BIKES ON A TRAINER” I use an older KHS Flite bike on the trainer. Problem is that the KHS is Ultegra 10 speed. I know theoretically the KICKR would work with the 10 but would it be prudent to just upgrade to the 11? Every bike company says it, and every bike company can be ignored. It’d never hold up in court, because every bike company sponsors Pro Tour riders, all of which use trainers at the start of time trial stages (and other stages). Plus, I’ve never heard of a company enforcing it. In any case, I’d just swap out the cassette on the KICKR. That’d be a lot less work than swapping out your cassette/shifting on the bike, and a lot cheaper ($50-$60 vs a boatload more). They could claim they are custom bikes used by pro riders and the bikes aren’t used for more then one season so small amounts of long term damage doesn’t matter for pro riders but will for home users who keep their bike a long time. Not saying they will stick to that. As always, great work on the review. 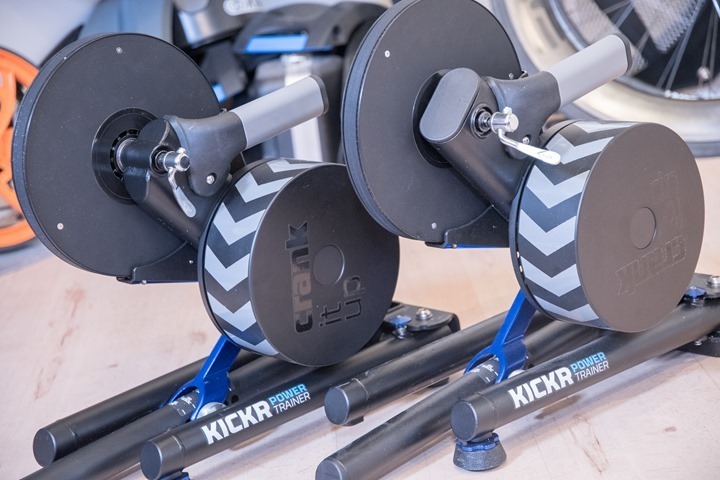 I am on the hunt for a new trainer and couple of questions re the Kickr. I see the 2016 model can now be purchased at a bit of a discount. I dont have disk brakes nor thru axle, so if I am reading it right I may as well get the older version and save a few $$? Also – I have both 10 speed and 11 speed bikes – can I just put an 11 speed cluster on the kickr and interchange bikes without any hassle? Also remember the 2016 version isn’t compatible with Wahoo CLIMB, so that’s the only other limitation. I have a blend of 10/11 speed bikes and often do what you noted. The problem is with Zwift (or anything else where you use gearing) is that you’ll get certain gears that shift like crap (or don’t shift at all). It’s not a total deal killer, but it’s annoying when you’ve got a mis-match. For ERG mode it doesn’t matter much since you can just fine the gearing that works and stay there. Do you think its Ok to leave it plugged in all the time? The lights are always on with the blue one blinking. Seems odd that they don’t have an on/Off switch to power it down. Where’s the ON/OFF switch? I was assuming that the Kickr would automatically turn OFF after a certain amount of time after activity, but a half hour after my initial ride with it today the lights were still on. Do I really have to keep pulling the power cord after each use? No switch or auto low-power mode. Best option is a power strip. Anyone seen power discrepancies like this- link to analyze.dcrainmaker.com with this kickr 17? All good for the first half of the ride then the kickr seems to drift up and is reading a good 10w more than 4iiii. Any chance of a temp shift in the room? I don’t think so, perhaps one or two degrees, certainly not more than that. I usually open the doors to my courtyard to let fresh air in whilst training but do this before I get on the bike. I never found my Kickr in line with my other power meters. You might expect otherwise from a 1100 euro/dollar device. I found my Kickr reading 15-20 watt under my Stages and 10-15 over my Quarq. All after warming up and proper spin downs. After some frustration with that I’ve decided my Kickr is here to stay as for it’s superb build quality, I can change fast between my MTB, road bike and the Mss. bike and for the ERG mode. I use TrainerRoad and overwrite the Kickr with the data from our power meters. We never use the power readings from the Kickr so we don’t care anymore. I only believe in power data when it comes from strain gauges as we all know that’s not the case within a Kickr. Thanks, my frustration is more that the Kickr and 4iiii both seem to read very well and are closely matched for the first half of the ride and then the Kickr seems to drift off as far as I can tell. In relation to Rays comment about temperature do you know what kind of temperature fluctuation is required to affect power reporting to this degree? No I don’t. All I know is that Stages has Active Temperature Compensation so it adjust temperature fluctuations while riding. Don’t know if 4iii is doing that. But from what you’re saying I should do a Kickr spin down (cold) and one after 15-20 minutes (warm), something’s widely suggested by other Kickr users and see what happens. Use Ray’s tool to see if the moment of calibration is in relation with the Kickr’s drift off. And then? Just live with it…I stopped worrying about it. A Kickr take’s it power on the hub, the 4iii on the crank. This alone can cause a difference of several watt’s. And your “problem” occurs after a given time, so you should look in the warmup/cold/spin down area. That’s where I’m confused – both 4iiii and the KICKR 2017 state that they do active temperature compensation. I’m concerned that all calibrating will do will simply change the point that the drift occurs? I generally calibrate every couple of weeks anyhow and I’ll go ahead and do that but it just seems strange that it drifts out so suddenly at the halfway point in that ride..
fyi, I calibrate every ride. On big rides I might even do it during a ride! I love data and want as many as possible of it as accurate as it can be. There’s not such thing as too many data ? This is a timely thread. I recently switched from a KICKR to a Tacx Neo and was very confused why sweet spot and threshold workouts on the Neo had a higher RPE and higher HR. Did I lose that much fitness in 1 week? There are several theories floating about as to why this happens: the high speed of the (geared) flywheel on the KICKR, the more ‘noisy’ power readings from the Neo in ERG mode resulting in same average, but higher normalized, power, the slight wobble in the Neo when pedaling and finally, temp drift in the KICKR. This morning I decided it was time to get to the bottom of this with two bikes (one SRM, one Quark) alternating between trainers. Calibrated everything before I started. Long story short, I found that both the KICKR and Neo were off by about 10-15W at 100W but once I got over 180W they were both stayed within 5W of the SRM and Quark. So, they’re not very accurate when noodling along at super low power, but no explanation for my RPE/HR discrepancies at sweet spot and above. Then I started the workout for the day: 4 sets of 2 x 9′ at 90-92%FTP with 1′ rests between reps and 7′ rest between sets. I did sets 1 and 3 on the KICKR and 2 and 4 on the Neo. Everything on the Quark bike. TrainerRoad, no powermatching. This is where i finally figured out the problem… and for me at least, it was temp drift on the KICKR. As the interval wore on, the KICKR would drift to ~15W (~6%) higher reading than the Quark. The Neo stayed stable. The 1′ rests were not long enough to restore the KICRK back to normal and a spin down did not help. The KICKR again matched the Quark on set 3, but it had all of set 2 to cool down. My conclusion is that longish intervals >250W heats up the KICKR and it either overcompensates, or does not compensate enough, for the change. It might be a unique problem of my KICKR which also seems very sensitive to sunlight. The Neo does not suffer from this problem. The last set in a long workout with long intervals has a higher RPE on the Neo because I’m actually doing the correct wattage. Whereas, on the KICKR, I’m doing 6% than shown. Does this really matter? I think if you only used the KICKR to measure your FTP (which would be overestimated) and do workouts, you’re probably fine. You’ll feel “stronger” at the end of workouts than you should and your FTP will likely be overestimated. Maybe short VO2/anaerobic intervals will be a bit harder than they should be. @Henry – did you ever figure out the issue and get a solution? I have been having the same problem, but just took me a while to realize it was happening. TrainerRoad looked at some files of mine and said that the offset changed part way through the ride. It is generally about 10% higher than my Vector2 pedals, but after drifting it is much higher. The drift/offset change is often preceded by a major lag in changing power at the start of a new interval. I am always doing the spindown on TrainerRoad beforehand and after the big drift it still lingers after doing another spindown. The temperature is pretty steady in the room too. No idea of a solution and still waiting on a response from Wahoo. If it doesn’t crash and then spike like above then I just see the power level drift up and up as the workout continues, but TR PowerMatch adjusts fairly well. Is this a common issue with the Kickr? I did also see some others with same issue in a Zwift forum which is why I ask. Do you know a solution if you have seen it elsewhere? I am asking because I got this model in prep for the Climb (both of which were gifts) and am receiving the Climb soon. At this point though I am seriously considering returning the Climb because this is preventing decent training with it going haywire often if Imcan’t solve it. Thanks for any advice or better explanation of what is happening to help me explain to Wahoo Support better. Can you try it without PowerMatch? I know TrainerRoad loves it and all, but honestly, I hear more issues than not with it. Admittedly this is the worst I have seen it when this happens. Need to make a bunch of sets in DCAnalyzer to see if there is a clear trend in past workouts. Think it really starts to drift apart about the 18-20 minute mark consistently and then just gets worse over time. I’ll give my next workout a try without PowerMatch to see what happens. Seem to think I had the same issue before using Sufferfest without PowerMatch though. Need to dig through old files because I wasn’t paying as close attention to my training early on using this Kickr to see. Wahoo support were pretty helpful especially once I sent them that data. They want it back to test it since they think it might be the thermistor that is the issue. Guess they have seen that in previous models, but not really in the 2017. What ever came of this? I am currently in the tech support washing machine with them (telling me to spindown or it’s BT interference, etc). Seems like I have the same issue you had. I can ride fine for a while, but if I go up the alp in zwift I can’t make it up without the kickr power “breaking free” where it will report roughly twice the power that I generating (compared to p1 pedals). This is the same for any “high” resistance for an extended period of time. Feels like an overheating issue to me. Curious if you ever got a resolution. Thanks! Not sure what the actual problem was. They had me send it back to test and they decided to send me a brand new 2017 Kickr to replace it instead of fixing it and sending back. No issues with the new one so far. But if you power completely off do you have to recalibrate it each time ? I would like to pair my Quarq ANT+ power meter to my KICKR which I use with the Wahoo Fitness app on an iPhone or an iPad. Apple devices require either an ANT+ dongle or an ANT+ to Bluetooth bridge (e.g., CABLE) to receive data from an ANT+ power meter. If I use a CABLE, the Quarq is essentially turned into a Bluetooth power meter. The Wahoo Fitness app includes an option to have an ANT+ power meter control the KICKR but there is no mention of a Bluetooth power meter. Is it possible to control the KICKR using a Bluetooth power meter with the Wahoo Fitness app? Has anybody tried this, and if so, what has been your experience? The new model 2017 is no longer compatible with the current campagnolo freehub adaptor. Are there any plans to release a new one or is there a third party campagnolo freehub adaptor for the 2017 model? Same question from me. Have you found a solution yet? I’m using a Campagnolo 10-sp bike on the 2017 Kickr with the SRAM 11-sp cassette. I installed a J-tek Shiftmate to adjust the rear derailleur movement to be more compatible with the cassette spacing. It’s working pretty well. No. No Compatibility with Campy drivetrain on the 2017 model. Wahoo Kicr2017 or Cycleops Hammer? I´m pretty happy with my tacx bushido, but looking to upgrade to a direct drive! I had a problem with the thru-axle spacer on the drive side : it somehow scraped against the inside of the cassette, causing all kinds of very unpleasant sounds. Wahoo responded very promptly to my email (“The noise you are hearing is due to a mismachined drive-side spacer. We have remachined some to correct specifications”) and sent me a replacement within one day. I’m having an issue with the drive side thru-axle spacer as well. In my case, it’s too short and I can’t get my derailleur aligned. Wahoo support was of no help so I’m hoping my LBS has a solution. Kinda bummed because I loved the 2016 kickrs I used at a bike studio and was excited to have one at home. Question on alignment. So on my old KICKR 2016 I could drop on my two Giants (2016 models) and all was in alignment with the rear cassette. Fast forward to end of last year when I picked up the 2017 KICKR as my wife now has thru axles on her bike as well as us both having disc brakes, and things are a little whacky. Her Canyon which has the newest ultegra lineup on it works just great on the setup. But mine needs to be adjusted whenever I want to put it on. Driving me a bit crazy also because I mucked up one of my bikes a little doing this back and forth. Anyone else have experience with this? I wonder if it is because my older ultegra cassette has a slightly different alignment from the newer compatible cassettes they are putting on the new KICKR? Curious if anyone else has similar experience. I just hate touching the barrel adjuster each time i come off and on the trainer. Good reason to have a secondary bike for me on the KICKR (which seems a bit silly though). In my experience, it has to do with having (or not having) a spacer in the cassette. Are we likely to see a 2018 model this year? Or is it safe to buy the current (2017) model? It’s always safe to buy the current model, but at the same time note that for the last few years Wahoo has been pretty consistent on annual releases. Kickr Core (likely close to $800-900 price range?) with fixed legs and possibly de-rated capabilities is coming (per FCC docs via Google search). Not sure on a high end model? On Monday I was able to purchase the Kicker v3 2017 model for $999 from Ericks Bike Shop in Wisconsin. Today they told me they are sold out and Wahoo is no longer making the v3 because they are coming out with the v4. I found the v4 rumor that it was lighter but not much else. 1. Is the rumor true? 2. As a new cyclist, is it worth waiting for a newer version? 3. Do you think there will be other improvements that are worth waiting for? I have been riding since April with a cannondale cad x and I ride 2 to 4 times a week, training for my first century. Thanks. I’m looking in the $900 market for a trainer. The Kickr Core is in my price point, but I’d have to buy a spare cassette and tool, so I’m up to around $970. Is it worth buying the 2017 Kickr for the current Wahoo price of $999 while I still can? Really comes down to sound at that point to be honest. I wish I had a good answer, but that’s basically it (and of course the ability to go up/down height for different bike sizes -but I suspect that doesn’t matter to most). I purchased the 2017 kickr reconditioned last summer. The kickr at a certain speed made a strange resonance noise. I was replaced in warranty, but the one received has the same noise problem. Has anyone had the same problem and found out what caused it? Thanks to those who will give me answers.